Devlin was down the hallway. He didn't exactly know where to go, or what to do. He had caught a terrible cold and had been sneezing up a storm the last few days and was finally over with it. He had no idea where to go or what to do, so he just sat in the corner of the hallway, scared to even move. Alidia was sulking in the hallway. Singing her song. Touching the walls and the paintings. Ariel and Jim are so lucky in love, Alidia thought, And.....me, she started to tear up My love is missing. Then she bumped into Devlin and he looked scared so she perked up her emotions. She smiled, "Hey Dev, I'm here." She held out her hand. Devlin looked up at Alidia and reached for her hand. "Hey Alidia." he said shyly. He listened to her song it was pretty and was how he was feeling. "You're song was pretty." he said in his own sweet little way. Alidia was shocked. "You...heard ....my song?" Alidia said in shock. She nevrousily giggled to herself. "Thanks...it was how I am .....feeling." She held his hand, and looked at him with sister love in her eyes, "I have missed you, my little brother." She wrapped herself around him in a hug. And the tears started up again, but she didnt care. Rapunzel skipped down the hallways, humming happily to herself, before seeing two students, looking rather emotional. She pouted and skipped over, "hi!" she exclaimed and waved quickly. "Is everything okay?" she raised her eyebrows questioningly, hoping she hadn't disturbed their conversation or something. OOC: Sure you can join. More the merrier . Devlin hugged Alidia. "I missed you too." He did miss her. Then he looked up at Rapunzel. He didn't know what to say. "Hi, Rapunzel. Got lost again and Alidia came down the hall." "Hi, Devlin" she smiled at the boy before looking at him and Alidia. "I get lost all the time" she sighed, almost as if it were some major deal. "Oh! Look what I found today!" she exclaimed and dug through her abnormally large handbag. She pulled out a fry pan with a grin, "it's been too long since I've used one of these" she chuckled and slightly twirled it around her finger before it hit her in the head. "Ow" she pouted and rubbed her head before chuckling sheepishly. Alidia looked the girl with golden colored hair when she stopped hugging her little brother. "I'm sorry but I don't think we havent met before," Alidia stood up as she looked at this girl, "I'm Alidia." Alidia held out her hand. Devlin couldn't help ,but give a light giggle at Rapunzel with the frying pan. He smiled. He looked up at Alidia. Rapunzel held onto her frying pan before smiling at Alidia, "hey, I'm Rapunzel!" She shook the girl's hand. "It's nice to meet you" she smiled and gently rocked from side to side before giggling lightly when she heard Devlin giggle. "So, have you heard about a carnival? Apparently there's going to be one soon!" She beamed and slightly jumped up and down excitedly. Alidia smirked. "I really like your name. And a carnival?" Alidia was quiet now and kinda twisting her hair. She wasn't much of a carnival person after thats when Deanne did his curse on her. "A carnival? That sounds cool." said Devlin with a smile. "Uh what's a carnival?" asked Devlin. He actually never heard of a carnival before, growing up in the mountains and traveling with Six, kept his life pretty busy. A carnival was one of the things he never actually heard of before. Alidia thought bout it. " A carnival is like a fair. It has games merrygoround and other things." Then Alidia was quiet again. "Uh, I know what cities are. You are talking to a boy that spent most of his life in a cave or in some old ghost town. I never read a book on Carnivals, so what is a merrygoround?" said Devlin getting a bit more confused. Rapunzel listened before smiling, "that's why you should come! So you can experience your first carnival! I've never been to one either! I've only ever read about them" she sighed and lightly tugged on a few strands of her hair. "Isn't a merry-go-round a ride that spins in circles and you sit on horses or something?" Rapunzel looked at Alidia, a puzzled expression on her face. Alidia shook her head in agreement. She still was quiet. She wasn't a carnival person. "Darn Deanne," Alidia thought as she played with her hair nervously. Devlin looked at Rapunzel. "That does sound like fun and I think I will go, that is if Six allows me to, but I think he will." he said. "You actually never been to a carnival either?" he asked Rapunzel. "Truthfully?" Rapunzel smiled at the two, "yeah I haven't been to a carnival before... I was kept in a tower my whole life, up until now" she sighed with a small frown. "So we can have our first carnival experience together, if you want?" she looked at him with a smile. Alidia kept playing with her hair. She had an idea. "Can I join you guys too?" She said quietly. 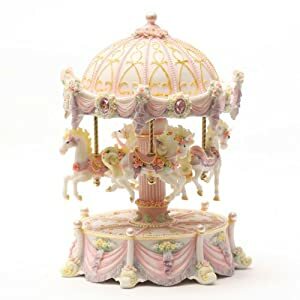 Though she had bad memories, she wanted to make new ones with her newfound friends and she flicked her fingers to make a mini merry-go-round appear. "Its going to be like this," she held out the merry-go-round. Devlin looked up at Rapunzel and smiled. "I would like that." and then he looked at Alidia. He was only a boy of eleven. He felt that it was up to Rapunzel to say it, yet he would love it. Alidia began to sing bout her newfound friends. Devlin listened to her song. He liked it. Alidia was silent after she was done singing. "You do have a pretty neat singing voice and the song was cool." said Devlin with a smile.